The mountain bike gear review pages on singletracks.com are crammed with great information but for newbs it can seem overwhelming at first. 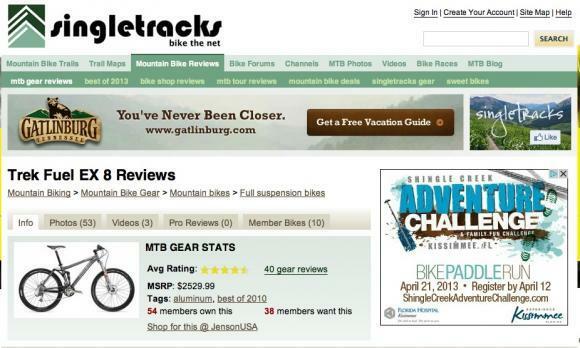 This article will explain how to get the most out of the mountain bike review pages on singletracks. On each gear review page you'll see a series of tabs near the top of the page. The first "info" tab shows the product description, photo, reviews, average rating, MSRP (if available) and other summary data about the item. Product recommendations below the product description are based on an algorithm that basically answers the question: What other items do members like if they like this item? Category recommendations are other items in the same category as the product (for example, other tires) while the "more" recommendations can include products from any category. Members may update their own reviews using the "update" link next to the star rating. A note will appear after the update showing the date the changes were made. Also, you can interact with reviews left by other people. If you read a review that is very helpful, feel free to click the "yes" button below the review next to the question, "Was this review helpful?" If, however, the review was very unhelpful and/or was off topic, click the "no" button. In the future, we may choose to organize reviews based on their helpfulness. Finally, if you want to respond to a specific review, click the "respond to this review" link. This is a great place to ask for additional information or clarification, or to correct someone if they submitted misinformation. 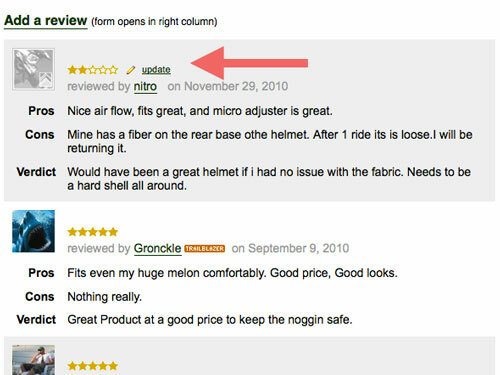 The Pro Reviews tab links to any articles about the item that have been posted to singletracks.com. Most articles include additional photos and more in-depth information about the product. The number in parenthesis in the tab title indicates the number of pro reviews available. The Photos tab links to pics submitted by singletracks members. Photos could show the product in action, modifications, vintage models, etc. - you never know what you'll find here! Like the Photos tab, the Videos tab showcases member-submitted product videos from around the web. The How-To tab showcases applicable how-to articles from the blog while the Customs tab links to dream bikes designed by singletracks members that include the product (more on that later). Singletracks is a user-generated website and the gear review dashboard gives everyone a chance to contribute! Write a Review: Let us know what you like and dislike about the product and give it an overall rating. You don't have to be a member to contribute a review but we do moderate anonymous posts. Add Photos: Yep, this is where you can upload an unlimited number of photos of the item. Just make sure you have permission from the photographer! Embed a Video: Found a good video review of this item on YouTube? Send us the link! How-to videos and action vids are fun too. Video links are moderated before they are posted. Add Tags: Help others find gear by tagging items using descriptive words. Tagging also allows us to break gear categories like pumps into useful sub-categories like floor pumps, mini pumps, and CO2 inflators. Good tags also include things like colors, sizes, capacities, and MTB disciplines (XC, AM, DH, etc.). Correct/Update: See an error in the product information or have a beef with a review? Tell us about it using this link and we'll take a look. Watch this item: Want to be notified whenever this item gets a new review? Click the link. You can un-watch an item by clicking the 'x' icon. Add to 'Gear Wishlist': Add the item to your wishlist and remove it by clicking the 'x' icon. Add to 'My Gear': Click this link to add the item to your "My Gear" list. Click the small 'x' icon to remove the item. + My Bike: If you are on a bike page, this button will add that bike to your profile as one of your bikes. After clicking this button, you can add more information to further customize your bike. Facebook "Like" Button: Give a click if you like this mountain bike trail and a quick note will be posted on your Facebook profile. The more data we collect on each item (reviews, wishlist adds, recommendations, etc. ), the more useful each gear page will become. This data is also used to compile our annual "best of" list.